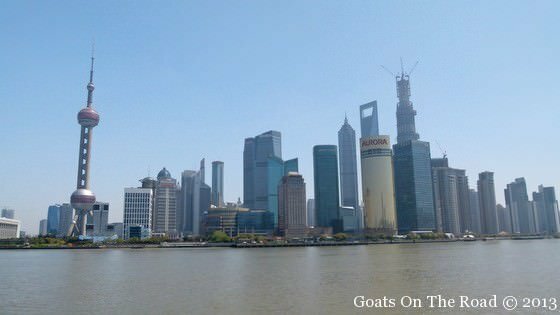 Goats on the Road Posts » Travel Blogs » Asia » Northern Asia » China » China and Mongolia: What’s The Difference?! 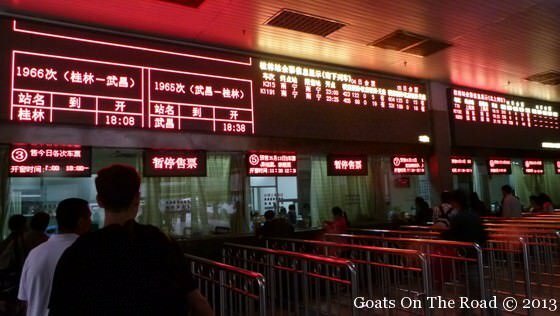 After living in China and teaching English for a little over a year, we learned a lot about the Chinese customs and ways of life. We loved living there and since then have also enjoyed a month spent traveling Mongolia. Even though these two fabulous countries are neighbours, they are light-years away from each other. We’ve made some observations about Mongolia and have discovered many differences between the Chinese and Mongolian cultures, people and customs. 1. Mongolians are bigger. A major contrast between the two countries is the appearance of the people. Chinese people tend to be quite small framed, slight and short’ish. 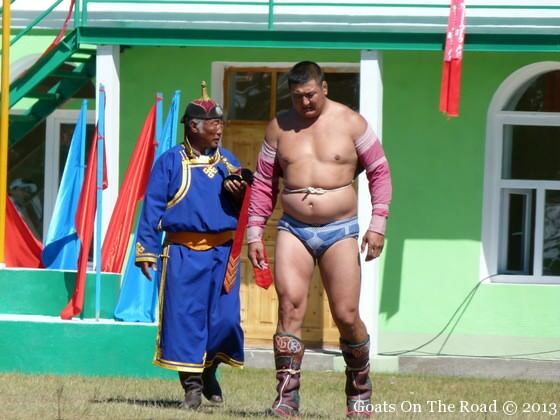 The Mongolians are a hearty breed of people, the men are muscular and stocky, while the women are voluptuous and curvy. Also, the Mongolians have darker skin and aren’t as concerned with being white and fair-skinned, as Chinese people are. 2. Chinese food is much better. 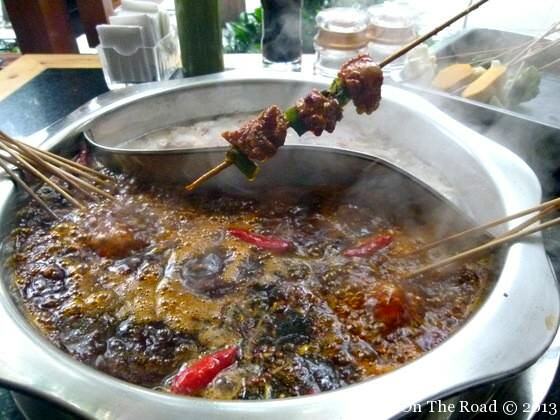 We’re all about eating the local cuisine of a country we’re in and even though there are some seriously strange street-foods in China, that cuisine is one of our favourites! Mongolian food is basically just meat and dairy. 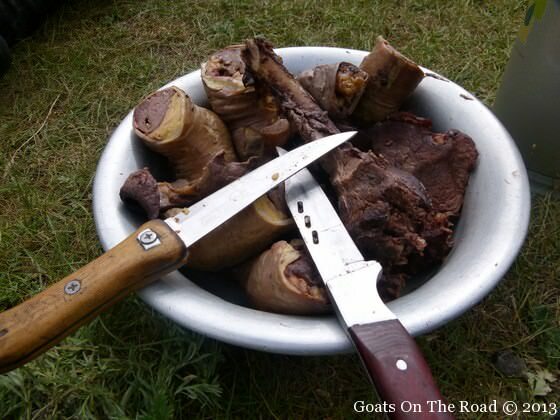 It seems that Mongolians (in the countryside anyways) eat out of necessity rather than for enjoyment. Chinese food is so flavourful, diverse and delicious! 3. There’s no smoking in Mongolia. In China, it seems like every man smokes. Whether it’s in restaurants, in shops or on buses, they all light up. In Mongolia, there are “no smoking” signs everywhere and the rules are obeyed. 4. English is more widely spoken in Mongolia. Apart from being in the major cities like Beijing or Shanghai, English wasn’t readily spoken in China. Even though it makes travelling to China more for the intrepid traveller and it was great to try to learn Chinese and fit in with the local people, it’s sometimes nice to have people understand what you want and need! 5. Chinese people have their own fashion style. The people in Ulan Bator (the only major city in Mongolia) dress quite trendy and have a very western sense of style. Out in the countryside, they don their traditional, and beautiful, clothing. The men and women of China have a very distinct, funky and fashionable style of dress, which makes them different from what we’re used to seeing in the west. 6. The air quality is better in Mongolia. This goes without saying. There are about 1.5 billion people in China compared to only 3 million people in Mongolia. Travelling through Mongolia has definitely been a breath of fresh air. 7. China has many cities. Mongolia only has one true city, Ulan Bator. The rest are considered small villages. Compare that with the zillion (or something like that!) cities in China and it makes for a more peaceful, less chaotic and less polluted country. 8. Mongolians are nomadic. Ok, so they aren’t many true nomadic people in the world, but this is especially true for Chinese people who predominantly live in populated cities. Mongolian people in the countryside live in gers and pack up their homes to move to greener pastures 2-4 times per year. 9. Chinese people love to eat fish, pork and chicken. Mongolians do not. While the Chinese enjoy lighter proteins like fish, pork and chicken, Mongolian people love their red meats! They typically eat sheep, goat, yak and horse. Hearty meats for hearty people, a must for keeping warm in the freezing cold winters. Mongolians love eating red meat! 10. 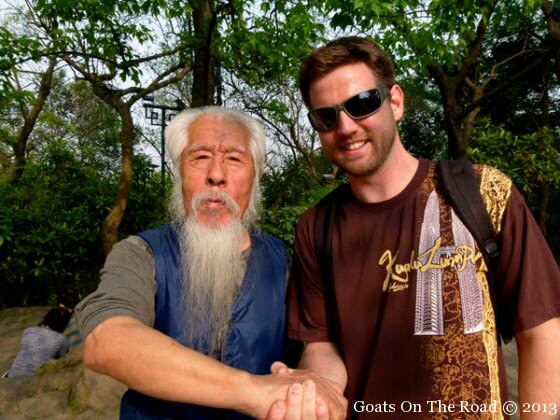 Chinese people are fascinated by westerners. I can’t count the amount of times we were the main attraction at a particular touristy site in China. We had our photos taken numerous times while living and travelling there and almost caused a few car accidents because of people staring at us, rather than the road! In Mongolia, they give a quick glance at us and carry on about their business – no staring and definitely no photos. Call us narcissists, but we kind of miss the attention. 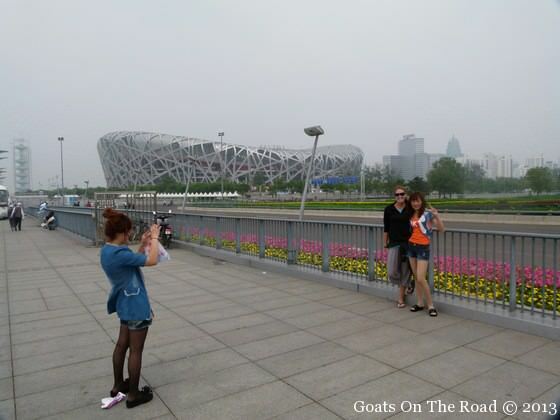 Chinese people are fascinated by westerners…even when they’re at a famous site, they wanted to take our photo! 1. Both languages are extremely hard to pronounce and learn. 2. Buddhism is a prominent religion. 3. Mongolia and China have very family oriented cultures. 4. Chinese and Mongolians are both extremely hospitable and friendly people. We miss living in China so much! The experiences we had there were life changing and unforgettable. Even though it was hard to say goodbye, making the choice to travel to Mongolia after completing our contract in China was one of the best decisions we’ve ever made. We had a blast travelling through Mongolia for 30 days. The off the beaten path moments we had and the nomadic families and ways of life we encountered are some of our fondest memories, ever. For more information on travelling to these two intriguing countries, check out our Backpacking Guide to China and our Guide to Backpacking Mongolia. 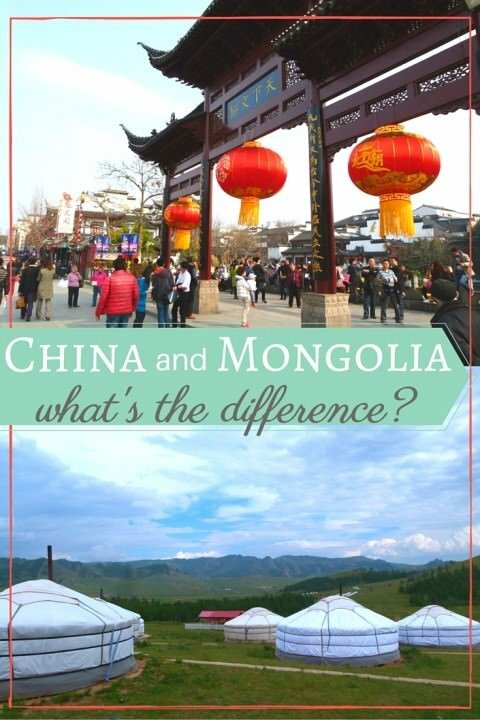 Have you ever been to China or Mongolia, or both?! What do you think of the culture and the people? Tell us below! No smoking in Mongolia?! Awesome! I hate smelling like an ashtray travelling in countries where everyone smokes and it’s so normal that there is no ban in indoor places or if there is, it’s just ignored. I agree, it was a breath of fresh air travelling in Mongolia! I haven’t been to either but I would love to have the chance to get to both. I had no idea Mongolia was so simplistic with the nomadic lifestyle and only one major city. Sounds like a very different pace from China. You guys should definitely try to check out one, or both, of these countries 🙂 Mongolia and China are both so different from on another, but both are so amazing. And it’s free to use internet in mongolia I mean like everybody can search and use whatever they want on internet. Great point! There are no censors on the internet in Mongolia. I so agree with your points! 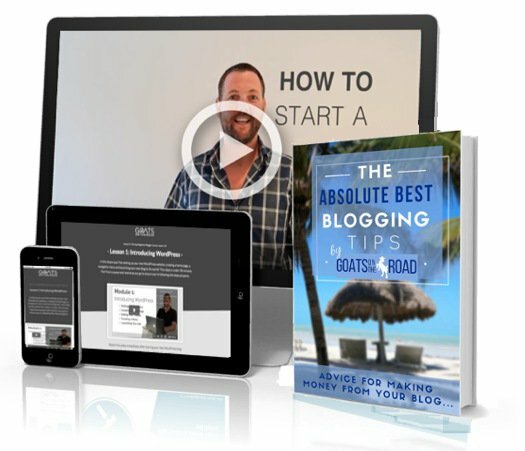 I love your site and the information you put on here is valid and in my opinion, true. There is only same thing between Chinese and Mongolians. They hate eachother. Hi! Where did ya’ll go in Mongolia? Tours, backpack the country, or transit? Hostels, tents? What did you do! Thanks! 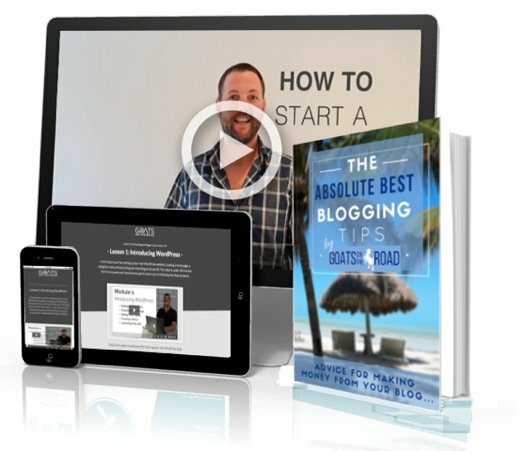 Hey, you can see all of our Mongolia articles and info here: https://www.goatsontheroad.com/category/blogs/asia/northeast-asia/mongolia/ Cheers! I’m astounded that you thought the air in Mongolia was clean. It’s the second most polluted city in the world. The particulates in the air are twelve times higher than the maximum recommended by the World Health Organization. The air in UB made me sneeze and get headaches, and that’s been in May/June, when it’s pretty good (not in winter, when they burn coal fires). I have been in Mongolia for a month and love it, but I wouldn’t want to spend much more time in Ulaanbaatar. I live in a rural area on Canada’s west coast by the Pacific Ocean and believe me, our air is clean there. 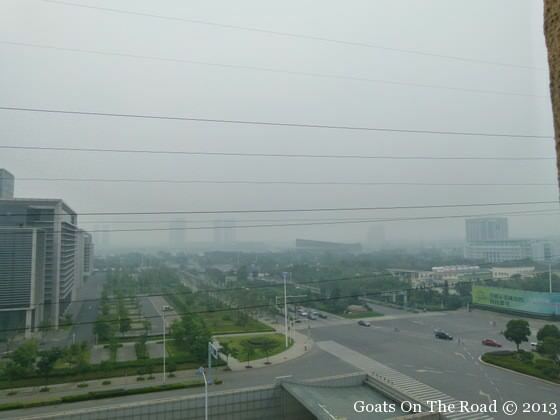 You’re right, the air in UB is awful! But in the rest of the country, out on the steppe, in the middle of nowhere, it’s fresh – especially compared to China. We were in UB for a couple of days, but the rest of the time was spent at lakes and out of towns. Of course, the air is better in Canada (which is one of the best in the world 🙂 ) – but between the two countries, overall Mongolia’s is better. Wee, only in the Winter. Rest of the season it is not that bad. Ub is the only air polluted city in mongolia. and if you compare it with chinese cities it is small city. and mongolian dish and other things are so differend from other asian countries. I lived in China for three years and am now living in Mongolia. Been here one year, will be here for one more. Overall, this is a good article but a couple of my thoughts: 1) most Mongolians, especially in countryside, dont speak english. I actually think its easier finding english speakers in china-at least in the cities. 2) true, mongolians dont stare at westerners/ have as much curiousity of their appearance because there have been Russians living here for many years. Many Mongolians think a westerner msy be Russian when they see them. But once they find out they are a westerner, they often are curious. I have had mongolians want to have their pic taken with me, though maybe not as often as in china. Hello everyone! I’m from Mongolia. I really appreciate it. Thank you for wrote! Of course, we are veeery different from chinese. We dislike to chinese. i don’t know why. Maybe this feeling is from our blood. I love Mongolian because they are not smoking…..